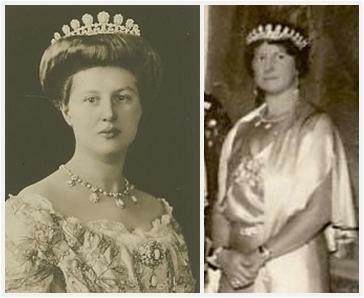 One of my personal favorite turquoise tiaras is the one that belongs to the Saxe-Coburg and Gotha family. It's a button style tiara featuring a larger set of turquoise stones, each surrounded by diamonds, set atop a framework of diamond scrolls. The larger buttons are separated by smaller turquoise pieces. The tiara is part of a set that also includes a necklace, earrings, and a brooch. The parure belonged to a previous Duchess of Saxe-Coburg and Gotha: Princess Victoria Adelaide of Schleswig-Holstein (1885-1970), who married Charles Edward, Duke of Saxe-Coburg and Gotha, in 1905. 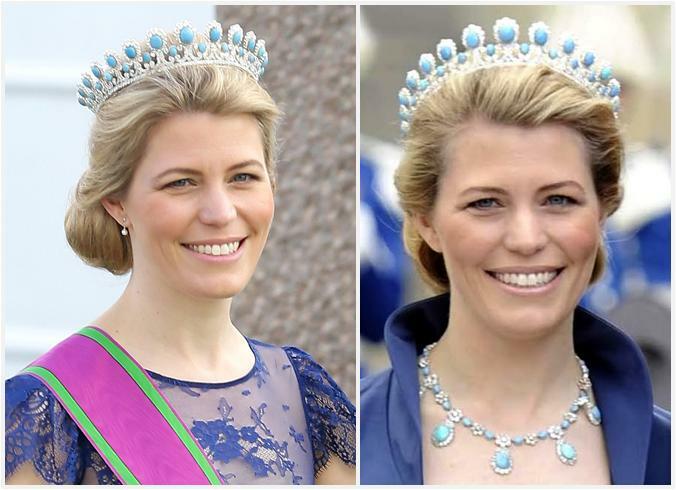 Today, we see the tiara on another Saxe-Coburg and Gotha lady: Kelly, the American-born wife of Hubertus, the current Hereditary Prince of Saxe-Coburg and Gotha (he is Victoria Adelaide's great-grandson). And we do get to see it, unlike many other gems from some of the non-reigning families out there. Kelly has worn it to a few occasions in recent years, including the weddings of both Crown Princess Victoria and Princess Madeleine of Sweden (one of Victoria Adelaide's children was Princess Sibylla, the mother of King Carl Gustaf). I'm always delighted to see it turn up, really. It's not that big, I mean it doesn't stick that far up off the head, but it's got that coronet styling that makes it grand no matter what its scale. And it's both appropriately turquoise-y and rather diamond-y at the same time - a nice mix of the stones. Turquoise tiaras aren't for everyone, but this one is certainly for me. Readers' Ultimate Tiaras: Pick Two Diamonds! Readers' Ultimate Tiaras: Pick Your Small Tiara!